Welcome to the Ready to Trade or the Virtual Goods and Gaming Economies Questline. In this questline, the guild officers and your investors will be from the educators’ guild Inevitable Betrayal. You’ll be playing or investing through the Arbitrage banking guild on the Horde side, Area 52, US server. 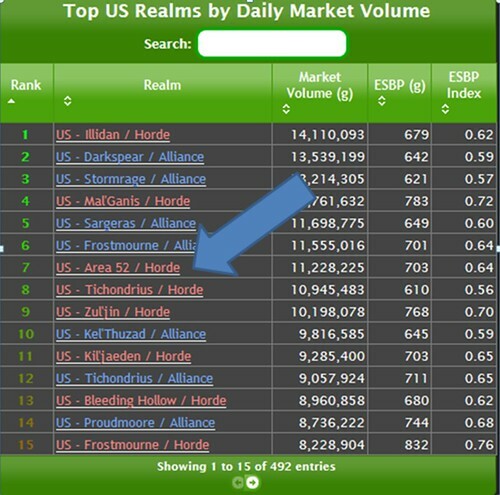 Area 52, the Horde side, is regularly ranked in the top US realms by daily market volume. Inevitable Betrayal raids on Sisters of Elune but for educational purposes trades on Area 52. For purposes of the questline, we’ll be working off on Area 52, but for anyone on a different server using your regular server as a type of control group could be…interesting. Do feel free to post comparisons in the discussions. So to get started, please introduce yourself to the guild and use these questions to guide your introduction. Who you are and your subject do you teach? What is your experience in MMORPGs? Are you already in World of Warcraft? What has been your experience in trading or earning in MMORPGs? Also if you find any of these topics intriguing, please post more in the Virtual Markets Café. And last but not least - Are you Ready to Trade? I'm Kae and I'll be one of the guild officers with you in the Virtual Goods and Virtual Economies questline that starts on October 1st. I’m also a guild officer in an educator’s guild known as Inevitable Betrayal. For this questline, we’ll be using the outpost guild, Arbitrage, on Area 52 realm, Horde side, U.S. server. I’m currently the instructional designer for an Immersive Learning and Game Based Learning grant that has three community colleges using World of Warcraft in Business and Economic classes. I developed my first virtual goods module in 2008. At my college, the business chair asked if I could design a series of assignment on emerging technologies and e-commerce for her students. At that time, we used Second Life as online environment where students could look at the commerce for virtual goods. A version of that is still being used at Pueblo Community College. It is now adapted to students choosing virtual environments in games. So there choices are World of Warcraft, Guild War 2, EveOnline, Perfect World, Second Life and every semester there is always one student who chooses to look at the economy in Club Penguin. So while we designed this module on World of Warcraft and hope you join us there. We are totally willing to let you do the questline through another virtual world. So email me if this is something you would like to do. All of our examples are World of Warcraft so there will be a bit of extrapolation on your part. But if you want to look at the economy in another game – do it! My background in economic simulations is from graduate work in Agribusiness and developing paper and pencil commodity markets for students and running them as events. I did this at the University of Nebraska and also for the state FFA camps. I found that the economy and auction house to be a very effective way to teach students about the market. But enough about me….. We want to know about you! Welcome to the Ready to Trade Questline! I'm Chris and I'm also one of the guild officers of the Ready to Trade Questline. I look forward to hearing from you all and getting to know more about you all as the Teacher Camp progresses. I am an Associate Dean for Career and Technical Education at the community college level and have been utilizing games and game based learning since I was a full time faculty member. I've used game based learning in Accounting, Business, Agribusiness and Multimedia Graphic Design. More recently, I've been heavily involved with an Immersive Learning Grant that focused on using World of Warcraft as a business simulator for Intro to Business and Intro to Microeconomics classes at the community college level. As the Guild Master for Inevitable Betrayal, it has been a lot of fun setting up the Arbitrage economic outpost guild and developing this questline to really focus on the business and economics epistemic frames that exist in World of Warcraft. Once you are in game, my toon's name is Terroir. So feel free to look me up and chat in game. Please let either Kae or myself know if you have any questions during your quests. I'm also very excited about the opportunity of introducing more educators to World of Warcraft, which really has become a third place. This virtual space is where our guildies meet, socialize, collaborate on projects, and pursue various aspects of the game and its implications and applications to K-20 education. What is your experience in MMORPGs? I have been playing WOW on the alliance side on and off for half a year. Are you already in World of Warcraft? Yes, Alliance character is Kimistria and Horde character (just started) is Kimayelle. What has been your experience in trading or earning in MMORPGs? I am horrible with the money part of WoW and took items from the guild bank so I could fund my new horse. I was summarily reprimanded. Who is your favorite economist? I am going to claim total ignorance here. I'm an experienced wow player and have recently joined Cognitive Dissonance on Sisters of Elune making a toon especially for it. I teach college economics and have used CIV for over 8 years for my Economics in Historical Perspectives course. I have used WoW a little and am eager to do more. I'm too busy to play as much as I would like (T_T). Most of my toons (kids and students) are on Rivendare which suffers from low population. MY QUESTION: Should I make a new toon on Area 52? You mention that you use Area 52 for trading while actually having the guild in Sisters of Elune (Alliance and Horde)... How do you transfer goods from one realm to another?!? In Inevitable Betrayal, as far as financing mounts the officers actually met to decide what we should do as far as guild funds. We decided to take an official hands-off approach. We have a guild celebration right before each guild member levels to 90. After they level, we take them over to the area for flying licenses. The individual players then normally inquire to see if the person leveling needs funds and gives them what they need. Not a loan, not guild financing but rather a gift and if the person tries to pay it back they are normally told to pay it forward. Hello Benjamin and welcome to the questline! So we'll give you some seed money to trade with over the next 3 weeks. We really can't wait to see the strategies people develop for playing the auction house.